Haute 100 lister Brett David, CEO of Prestige Imports and founder of the Ride 2 Revive organization, took to Gulfstream Park and Casino on January 23rd to host a charity event that would benefit children with terminal diseases. 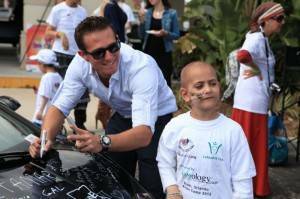 David partnered with the Simcha Layeladm foundation for the day, who invited some 25 children from Israel to take a spin in various luxury vehicles. READ MORE FROM THIS ARTICLE HERE.